What is periscope? It is a live streaming app. This app is suitable both for IOS & Android as well. Live streaming is a very long process from the content to production and live streaming. In between, there are many components like cameras, lighting, and audio to add the required flavors to the content that is going to live streaming. 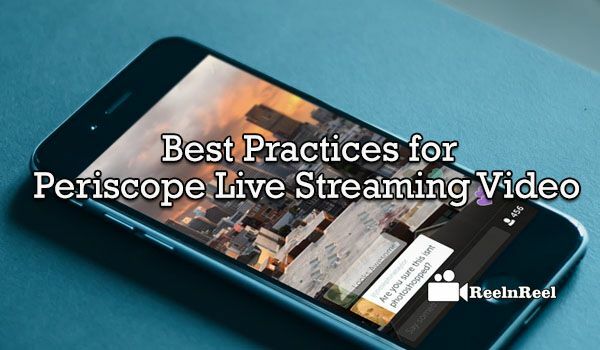 Now let’s briefly consider the best practices for Periscope Live Streaming Video. 1) Two is more powerful than one (you can schedule and stream live from more than one channels). 2) Video switchers are required for Periscope Live Streaming Video. Multiple cameras provide better video quality, and you need video switchers for proper coordination amongst the cameras. Video switchers can be either software or hardware. 3) Choose between hardware or software encoding devices. While live streaming shooting takes place on the site of the incident, it can be done offsite as well. 4) Finalize the quantum of streams (that need to be encoded and distributed). Use of more expensive encoders will enable generation of multiple streams onsite. 5) Try to record the Live Stream and reuse in other Social Platforms for promotions..
6) Closed captions (subtitles). As per FCC live, and near-live video programming must be captioned on the internet if it is shown on TV. 7) The trial before execution is required. The video that is going for live streaming needs to be test-run (with actual gear, from the actual location and with the actual subject matter) before actual telecast takes place. 8) Pre-run telecast. For ensuring proper success for your live streaming, you need to start the webcast much before the actual event starts. 9) Replay is required for your Periscope Live Streaming Video. Though live streaming is for instant watch, there may be a requirement that the viewers might desire to look at the video later point of time. 10) Plan B is a must. Despite the best content and best preparations, there is every chance that the streaming might not go as planned and in such cases, Plan B will come handy. As can be seen, there is a lot more work involved to bring live streaming to the end user. This gigantic task requires meticulous planning and an enormous amount of coordination with various agencies – both internal and external to the marketer.